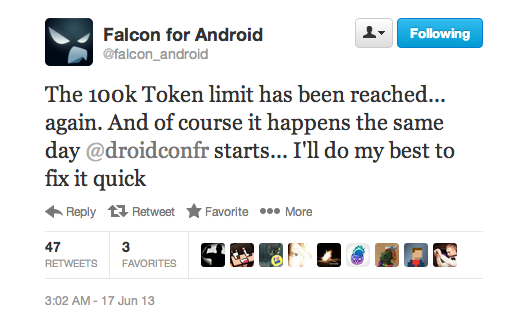 Falcon Pro, what is arguably still the most popular Android Twitter client of the moment, reached its Twitter token limit again last night. What does that mean for you? In order to free up unused tokens, the app’s developer has uploaded a new version of the app that resets all tokens. So once you grab the new update (when it goes live), you’ll have to login again with your Twitter credentials to claim a token and continue using the app. As I mentioned, this isn’t the first time that this has happened. A few months back, the 100K token limit was reached shortly after launch thanks to heavy piracy of the app. With this approach to updating the Play store version and resetting all tokens, it frees up tokens from those who have pirated the app and also who are no longer using it yet still have a token attached to their Twitter accounts. Twitter is unlikely to change their stance on token limits, so this will likely continue to be a part of the game for the foreseeable future. 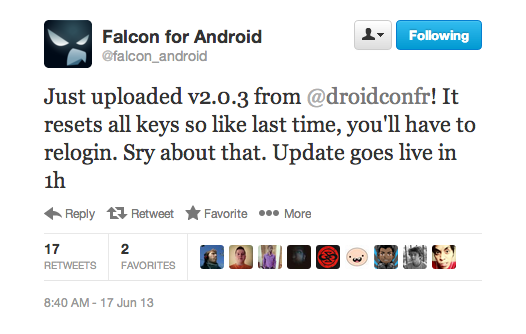 So to be sure you re-gain access to Falcon Pro, update immediately. We’ll be sure to let you know once the app is live. Update: It’s live, go download it and login!